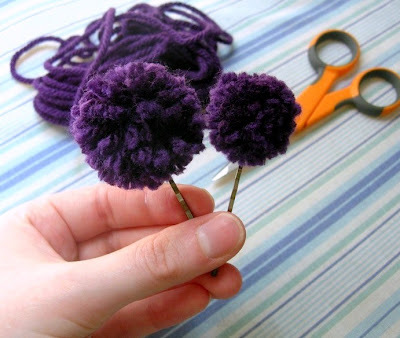 It suddenly came into my head the other day that I needed a yarn pom-pom (or two) for my hair. So I busted out my yarn scraps (this is the PERFECT way to use up those odds and ends! 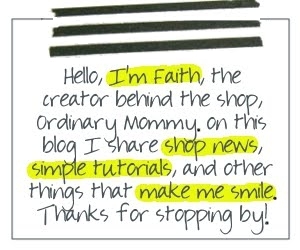 ), took a peek at this tutorial over on the One Sheepish Girl blog, and got to work! To make your pom-pom, place two of the same sized circles back to back and then wind the yarn around the "c" shape, continuing to wind until the center hole is filled with yarn. 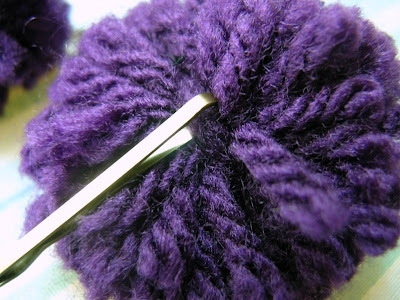 The more yarn you use, the fluffier your pom will be. 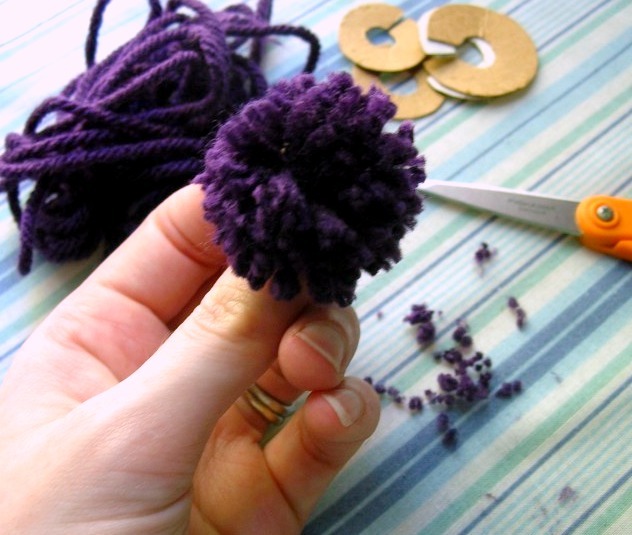 Pull the yarn tightly through the center and cut. Holding the circle of yarn tightly to keep the yarn in place, work your scissors around the circle using the cardboard as a guide. 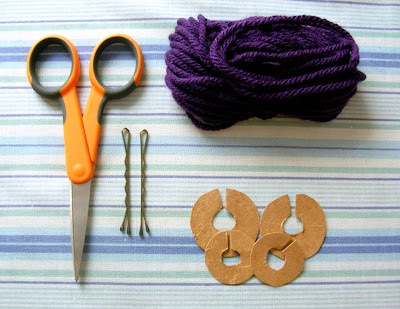 Then gently work a new piece of yarn between the two pieces of cardboard and tie a knot; work the yarn in the opposite direction and tie another knot. Cut the pom-pom loose! Trim the pom-pom and fluff it up a bit. 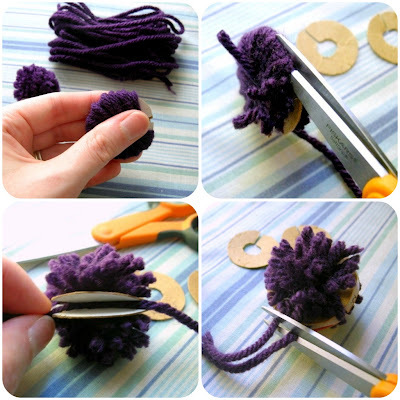 Find your way into the center of the pom and slide a bobby pin through the piece of yarn that was used to tie the pom-pom together. 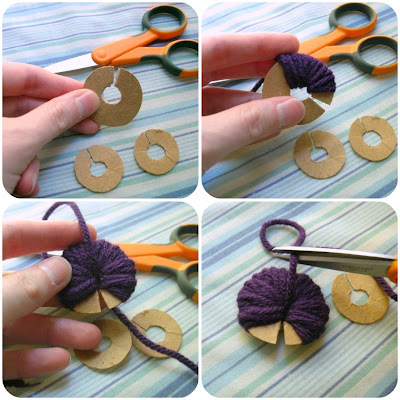 Now repeat the above steps with the other sized cardboard circle templates to make your second pom-pom. Voilà! 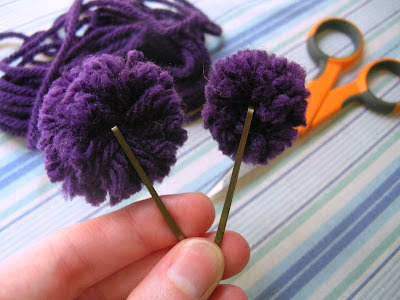 You now have two pom-pom hair pins! 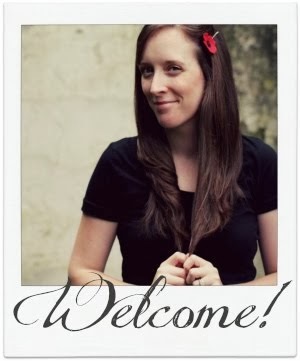 I'm thinking these new hair accessories will be great for the cooler months with a pair of skinny jeans and a cardigan, or a sweater and a fun pair of boots! What a great idea! 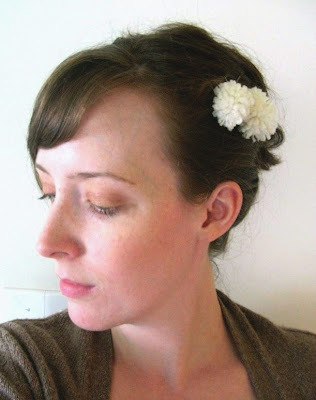 I have been looking for cute hair pin ideas and not finding anything, until now!